In Response to the lies and fabricated tantrums of the self styled defender of TB Joshua called Michael Lathbridge who was noted for notoriety, criminality, slapping and throwing sick people who refused to be brainwashed by him for an arranged or fake miracles. Michael Lathbridge was in charge of TB Joshua's prayer line where various manipulations and tricks are done. He miserably left Joshua in 203 when he realized that he had no future with Joshua because he wanted so much to be a pastor at all cost and Joshua denied him. He left Synagogue with his bag and phone. 1. Why did he leave Synagogue in 2003? 2. What brought him from London to stay with TB Joshua in Nigeria? 3. Which role did he play in the establishment of Synagogue Ghana? To set the records straight, Michael Lathbridge the so called defender of Joshua sought refuge with Joshua after he had allegedly committed a crime in London and was being sought after by the police. In addition to that, he was also suffering from a mental problem. Michael Lathbridge never played any special role in the establishment of Synagogue Ghana. I personally registered the church at the Registrar Generals Department and raised the church to the level it was before I left in November 2003. Michael's major assignment was that, each time Joshua visited Ghana, he organize and arrange for fake miracles. I have a list which I may release to the public soon if the need arises of over twenty (20) prominent Ghanaians who were arranged for healing by Michael and made them to testify that they were healed. Now, they are all dead. 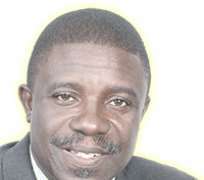 Ghanaians should demand an apology from Michael for his unpatriotic role to fellow Ghanaians. 1. 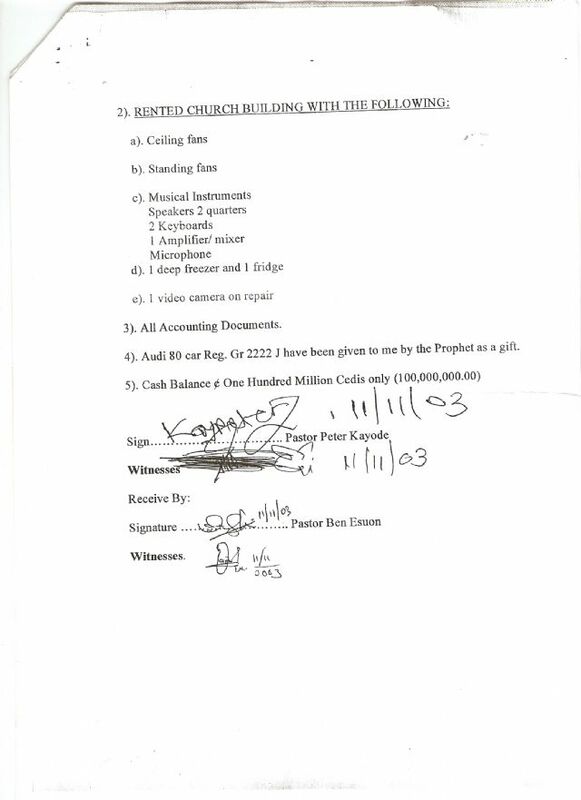 When I left Synagogue in November 2003, Michael Lathbridge had already left, where did he get the information that I stole money, car and properties belonging to the church. Hear say, isn't it? 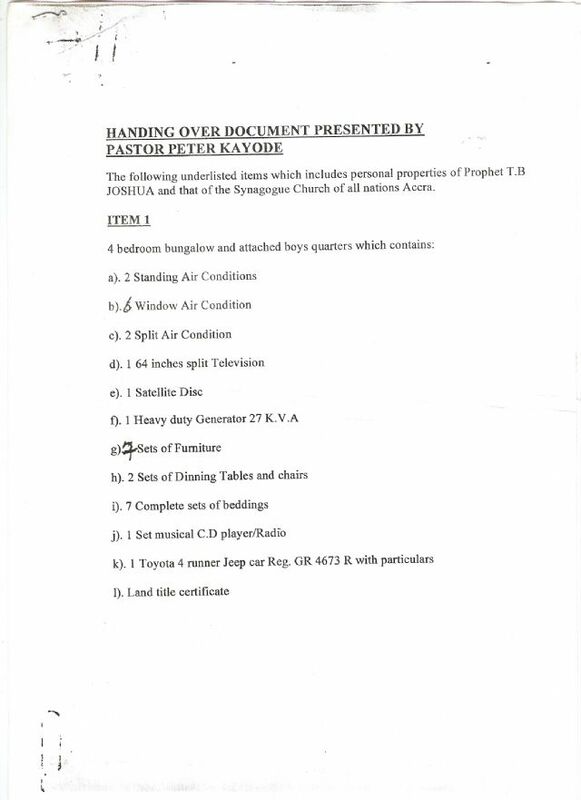 For the avoidance of doubt , a copy of my handing over notes is attached and this note attest that, I left Hundred Million Cedis old Ghana cedi, a Toyota jeep car, and house and other items. The old Audi car which he claims I stole was the only item I took along and this was with Joshua's consent. The car in question has been packed for over five years and disposed. 2. When Joshua sent my wife to Ghana in August of 2003, Michael had left Synagogue, where did he get his information that my former wife spent three months with me in Ghana, I ask? To set the record straight, my former wife spent one week with me though Joshua's plan was for her to spend six months so that when people see that my former was pregnant they will not doubt that I was responsible, so that Joshua 's amorous relationship with my former wife will be covered. It was like the case of David and Uriah. I knew her coming to Ghana was a set up and a cover up hence, I sent her back to sender. Now that Michael has left Joshua, he should confess his sins to God join a charismatic or a Pentecostal Ministry and start a new life again in Christ. He should stop his one man defending squad. E should reject the thousands pounds stalling Joshua has wired to him to appease for the wrong and humiliation he suffered under him. Michael should know that YOU CAN NOT FIGHT FOR GOD. If Joshua is a man of God, let God fight for him. I have forgiven Michael for slapping me on my church premises in 2003 when he came to create commotion and I refused despite the advice by my congregation and my lawyer to report him to the police for assault. IF JESUS SAYS YES, NO ONE CAN SAY NO AND IF JESUS SAYS NO, NO ONE CAN SAY YES. A WISE WORD IS ENOUGH FOR MICHAEL. This is the evidence of my handing over notes to Pastor Ben Esuon on the 11th November,2003. Click on any of the pictures below for more details.